The door of the bus was pulled off, and the new arrivals of refugees began to slowly filter out and into the camp. Children were carried by their mothers, their faces pressed-tightly against their mothers’ breasts. Those who were old enough, walked closely after. Not every child of every mother could make the trip to Uganda. Some were left behind in the Congo with their fathers. Those who had mis-registered children, or who could only afford to bring two out of five of their kids, had to deal with the insufferable reality that they may never see those children again. Athumani Halima, a local journalist who has long been covering refugee crises, observed a young boy of around seven exit the bus alone. “Where is your mother?” A volunteer ran up to the child asking. He replied in Swahili: “Alisha kufa.” She is dead. A crowd of refugees, who had been in Kyangwali camp for a number of years, stood and stared at the people being offloaded from the bus. There was a lack of expression on many of the faces of those who had arrived, and of those who had stayed there for some time. Going through the screening process, which required a medical vaccination, you could hear children screaming as they were injected one-by-one. 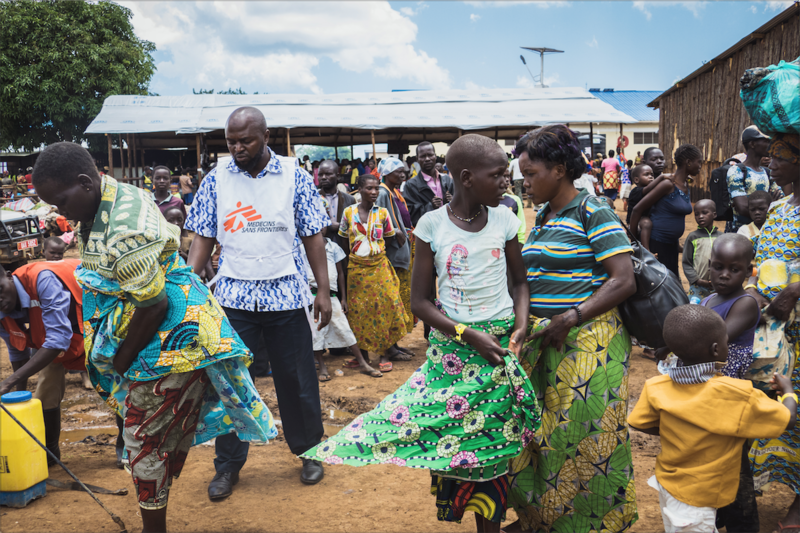 A recent cholera outbreak which had reportedly killed 36 individuals in the camp, had heightened the importance of health screenings before admission. 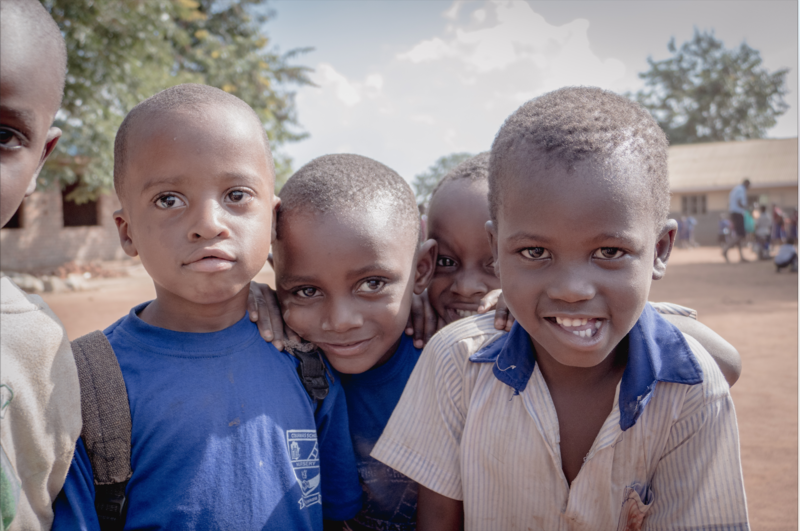 In the DRC, it is estimated that there are over six million children suffering from chronic malnutrition – and only 25% of children have birth certificates. Escalating violence means that access to education is becoming increasingly difficult. The Global Partnership for Education estimates that 3.5 million, or 26.7%, of primary age children are out-of-school, of which 2.75 million live in rural areas. Furthermore, the sector is facing a wide range of challenges with regard to quality, governance and disparities. 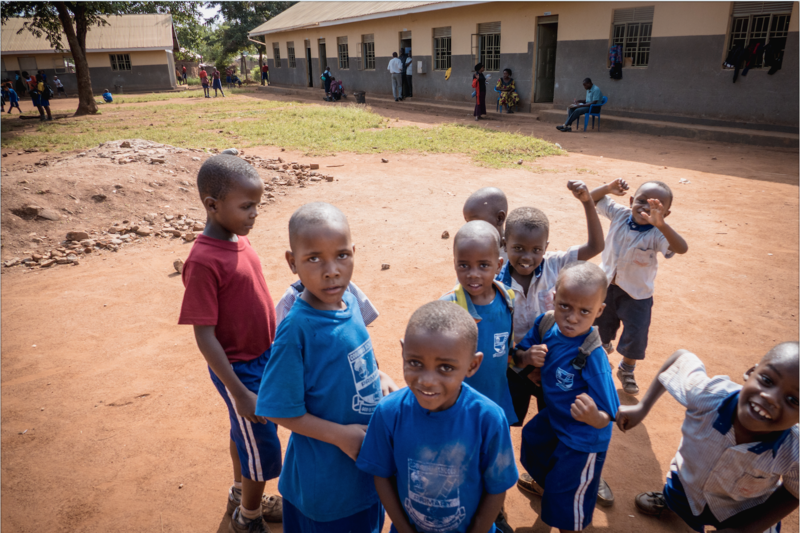 There has been an improvement over the last few years in the completion rate of primary education completion, from 29% in 2002 to 70% in 2014, however, the DRC still remains one of the countries with the largest number of out-of-school children. As we met the children in the camp, some managed a fist-bump or a thumbs up. But any smile seemed forced – their little minds trying to process the horror that they had fled. A confident boy of 10 years old told me that he remembered loud bangs in the distance, and people crying back home. He said his mother and him ran away because of the fighting – he did not mention his father. At 10 years old a child should be entering the latter years of their primary education, not scrambling through jungle to the shores of Lake Albert to board a makeshift boat and take the dangerous day-long trip to Uganda. To many, the situation that these children are entering into as refugees seems a hopeless one. Resources are stretched, space is deteriorating and the camp’s population is increasing everyday. But one organisation, founded in 2005 by refugee youth, is looking to alleviate the suffering for these refugee children. COBURWAS International Youth Organisation To Transfer Africa (CIYOTA) a volunteer-based, non-profit organisation based in Kyangwali refugee camp has given thousands of refugee children the opportunity to gain a full education. They believe that through education, they can help eradicate poverty, heal conflict and spur economic growth. I visited COBURWAS, the primary school in the heart of the settlement. It started as a nursery school with around 40 children in 2009 – fast-forward 9 years later and the school has approximately 500 children and an impressive examination record. “These children are facing a very tough time,” Headteacher of COBURWAS, Okoboi John Bosco told me. John has been working with the school for a number of years, and has overseen a great change in both the school and the children. “Year-on-year we have added class-on-class. Children have passed through our system and gone on to secondary and university. They have made it. “We are seeing change in the children – their social behaviour and knowledge. Some are even talking of community projects to help. The long term change is yet to come as they pursue their studies,” John added. Walking around the grounds of COBURWAS at break time, dodging various footballs and children who grouped up for photographs, it was clear that these kids’ outlook had changed. Most had been born in the camp, or were very young when they had arrived in Uganda. Education had given them a freedom to express themselves, to articulate what they had experienced, make friends and plan their future. 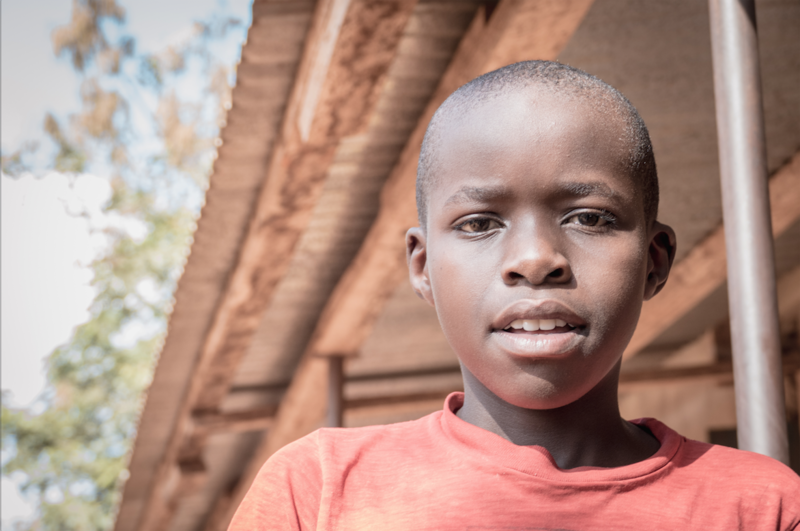 “When I grow up I want to be a doctor because people in this community are suffering from cholera and I would like to help them,” Kesha, a boy of 9 years old, told me. “When I grow up I want to be a teacher. Teachers make a lot of money,” a 10-year-old girl, Annahsifa, said. “These kids have got plans,” John told me as we walked through the playground. We paused on the school field and watched children cast makeshift tree branch javelins and measured the distance of their throws. It was the mark of the resilience of human nature – to find hope in darkness. 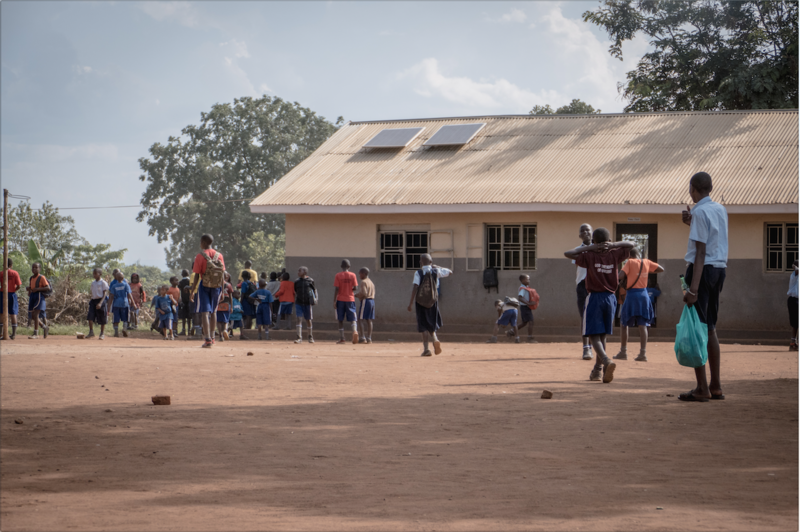 These children had watched everything in their life get broken – yet through education and the help of CIYOTA, had stooped and built it back up again with worn-out tools.